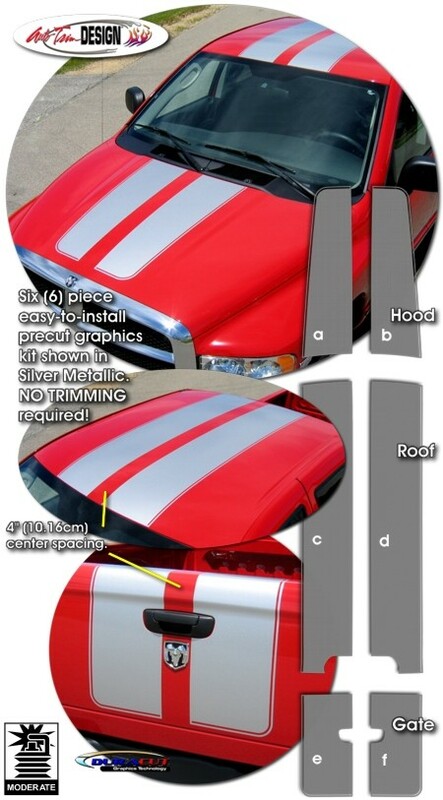 Make your '94-'08 Dodge Ram Truck "Tough-looking" with this awesome Rally Stripe hood, roof and gate graphics kit. This easy-to-install kit is packaged as a set of six (6) pieces with a classic 1/4" (6.35mm) pinstripe at the outside perimeter as shown. They're PRECUT and ready to install in a wide variety of colors - NO TRIMMING required! Kit is specifically made for the '94-'08 Dodge Ram Truck factory hood, roof and tailgate areas and will not fit any other vehicle. Select from two (2) vehicle models - Regular or Club/Quad Cab trucks. Note: Due to structural rib supports found on Mega Cab roofs, we do not offer a kit specific to this model. We suggest ordering the Quad Cab kit and installing a trimmed portion of the Roof pieces ahead and behind the structural roof rib supports. Rally stripes are set for 4" (101.60mm) center spacing at time of installation.